The pumpkin still life watercolour 2013 40 x 50cm 16 x 20in. LONDON.- ‘When I paint,’ Marc Chagall once said, ‘I pray.’ If praying is understood as celebration, a summing up of what one holds dearest, then this comment describes well the ideas and values which underpin the paintings of Lydia Corbett, never more so than in this new sequence created over the past two years, World in a flower. For Corbett celebration may on one level be personal, relating directly to happy circumstances in her life. On another level the focus comes from various epiphanies experienced along the way: in recent years, for example, from her fascination with the teachings and example of St. Francis, arising from a visit she made to Assisi. It may be that the search for a spiritual equilibrium which defines the mood of many of Corbett’s compositions, combining reverie with a delight in everyday things, is a response, which has lasted across the decades, to the seminal encounter of the artist’s early years: the time in 1954 when, still under twenty, she spent some four months at Vallauris on the French Riviera in thrall to Pablo Picasso as his reigning model and muse. In the combative and competitive environment which surrounded Picasso at this period an inner calm and detachment enabled her eventually to part company with him while remaining still on best terms, a rare if not unique situation in the convoluted history of Picasso’s relationships. Nowadays Lydia Corbett divides her time between her home in the West Country and the Provençal village near Orange where she shares with her brother an old house inherited from her father, the distinguished Paris art dealer Emmanuel David. Most often she works in the idiom she has made her own: a fusion between the crisp, drawn line of Gallic tradition (in some ways reminiscent of Jean Cocteau’s approach), and the harmonious, embracing flow of British watercolour. 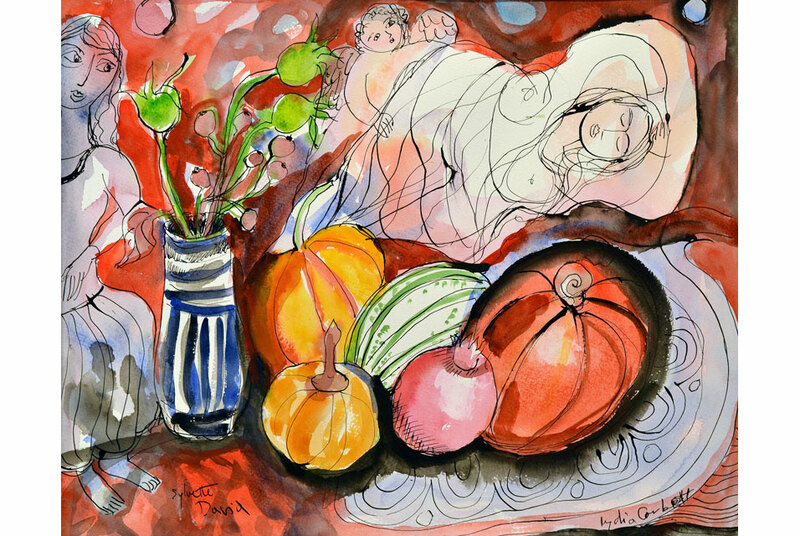 Typically, the starting point of almost every composition of Corbett’s is a still life built generally around a central motif of fruit, vegetables, flowers in a vase often set against a landscape which expands to encompass glimpses of buildings and human figures, real or imagined, friends and family members or perhaps characters drawn from mythology, religious sources or her personal taste in fiction. Each of these compositions seems at first glance to consist of seemingly disparate, unrelated elements. On closer inspection, it becomes apparent that behind every composition there lies a distinct logic and mood in the way in which one subject introduces another, rather as Picasso’s imagery can be seen to morph seamlessly from one subject to another in Clouzot’s ground-breaking film, Le Mystère Picasso. As motifs in the watercolours dissolve and displace each other, so the different elements in Corbett’s compositions often seem to occupy different time frames, while (as in the sacred art of Byzantium she so admires) sometimes gracefully defying the rules of gravity and perspective. Lydia Corbett (neé Sylvette David) was born in Paris in 1934. She grew up in an artistic environment (her English mother being a painter, her father an established dealer in contemporary art with a gallery on the Champs-Élysées), though she received no formal training. In the 1950s she met Picasso at Vallauris in southern France. Following the artist’s separation from Françoise Gilot, his meeting with Lydia (then still Sylvette) introduced a new phase in his work and she became the model for some fifty paintings and drawings (the Sylvette Cycle) as well as many ceramics of this period. The “Heads of Sylvette”, a series of painted folded metal sculptures which Picasso developed at this time, mark the next major innovation in his sculptural work. Around a quarter of all the Sylvette paintings are now in public collections worldwide from the Art Institute of Chicago to the Kawamura Museum of Art in Sekura, Japan. In 2003 in Picasso et les Femmes at the Chemnitz Museum, Germany many of these works were shown in a section of the exhibition devoted to the Sylvette cycle. Lydia Corbett moved to England in 1968 and has been represented by Francis Kyle Gallery since 1989. On the occasion of the Tate Gallery’s 1993 exhibition of Picasso’s sculpture and paintings, a documentary film on Picasso and Lydia Corbett was shown on BBC2. In 1991 she exhibited in Japan and in 2004 in the United States. Over the past twenty-five years Lydia Corbett has held twelve one person exhibitions with Francis Kyle Gallery. The present exhibition marks a span of sixty years since the months Lydia/Sylvette spent with Picasso in Vallauris and coincides with a major public exhibition in Germany concentrating entirely on Picasso’s works inspired by her.